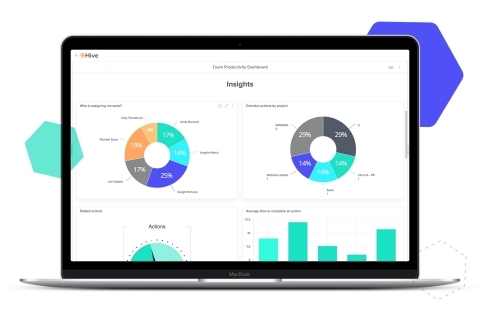 NEW YORK--(BUSINESS WIRE)--Hive, the productivity platform for high-performing teams, today launched predictive analytics to help managers, teams, and individuals forecast their workload and make the strain of reactive tasks a thing of the past. Hive is an integrated collaboration platform combining task management and messaging to help people get more done and be less stressed. It is powerful and simple, and loved by managers and users alike at companies like The Economist, Starbucks, Samsung, and WeWork. “I’ve been waiting 12 years for this moment,” said John Furneaux, co-founder and CEO of Hive. “Throughout my prior career in customer success, teams from multinationals to small businesses told me that their number one request was a way to know not just what’s happening today, but what’s coming tomorrow. More organizations are realizing that their people’s productivity is their number one competitive advantage. With Hive Analytics, users can access dashboards that visualize critical business insights and trends about productivity. Hive uses machine learning to proactively notify you about anomalies and opportunities, including resourcing and bottlenecks, with actionable suggestions to help teams save time, money, and headaches. For example, Hive can now tell you if your team will be understaffed next month, when you have too many tasks on your plate for tomorrow, or help you understand what times of day you are most and least productive. "When leading a team it is crucial to have transparency into what everyone is doing,” said Jerem Curry, Global Head of IT at The Economist. “With the insights gained through Hive Analytics, we can now make educated and timely business decisions to constantly improve our efficiency." Standard Hive Analytics dashboards are available to all current Hive customers, and can be trialled for free at www.hive.com. Enterprise customers can also build and customize their own dashboards to best reflect their critical business needs. You can learn more about Hive Analytics here. Hive is a productivity platform for seamless project management and collaboration that helps organizations and teams work smarter and reduce stress, today and tomorrow. By connecting people, tasks, data, and 1000+ integrations, Hive delivers workflow management and insights for enterprises and startups alike, including Starbucks, WeWork, and The Economist. Launched from #1 global accelerator AngelPad, Hive is headquartered in New York and backed by $5.4m in funding from leading venture capital firms Tribeca Venture Partners, Vocap Investment Partners, and Rembrandt Venture Partners. Hive launches industry-first analytics to help managers, teams, and individuals forecast workloads, increase productivity, and eliminate stress.